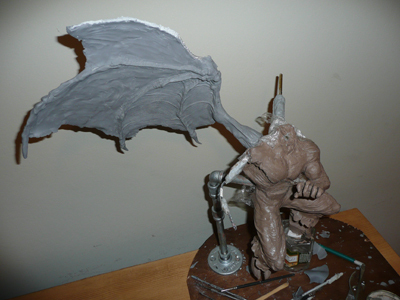 My first major sculpt that I have been working on is Illidan (above), a character from World of Warcraft. In fact, this is only the second thing I have sculpted and it’s a doozy. I have only recently started to sculpt (around the beginning of 2008) and I wonder if I’m crazy taking on such an ambitious project so soon. If I had thought it through, I would of done something very very simple. Take my advice, when you are just starting out, sculpt simple things to learn the material, then work on balance, anatomy, etc. I started this project using ProClay. 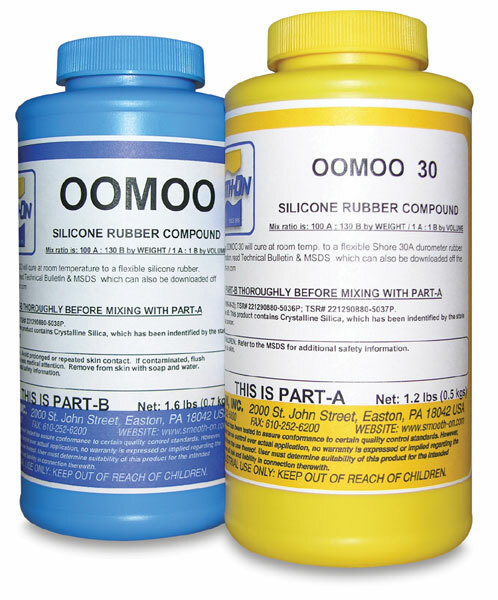 I heard about it on a forum and was drawn to it because of its high-wax content, and hardness. I want a lot of detail in the project, and Sculpey didn’t click with me at first (although, I did use it on the wings and will start using it more in the future). The ProClay wasn’t hard enough for my liking, and I decided to switch to wax. I built my own wax pen (that’s another post) and read about FUSE, an amazing wax from Willow Products. I bought a bunch and that’s what I am using for the upper half of the body. I am trying Gary’s Zen wax next (his latest and hardest wax). 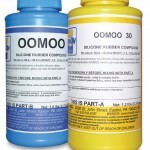 Last weekend, I took the sculpt I had roughed in with ProClay and started to make wastemolds with OOMO30 and alginate. 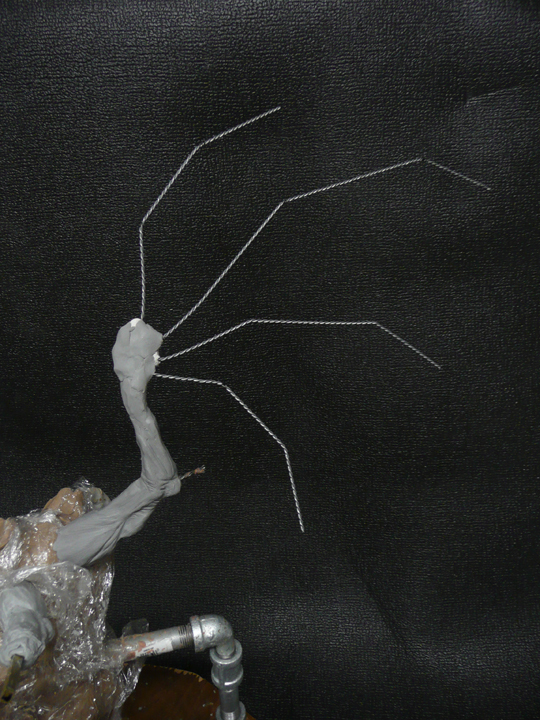 I poured the wax and started to key the arms and now I am working on adding details (more posts to come. It has been a long road, but I’m less than halfway done, all things considered. 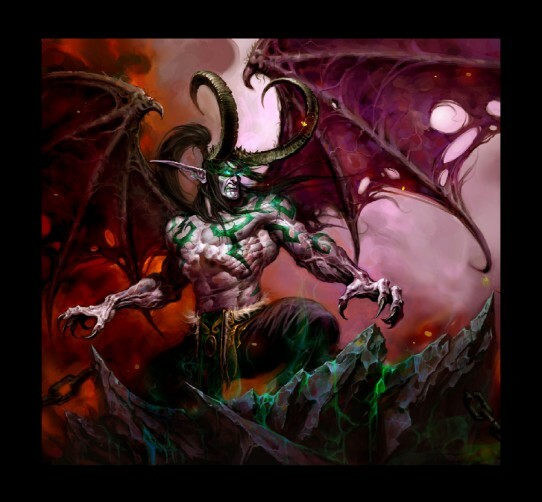 I have re-sculpted every part of Illidan at least twice. I sculpt, figure out what is wrong with the pose, form, anatomy etc, and then basically start from scratch. 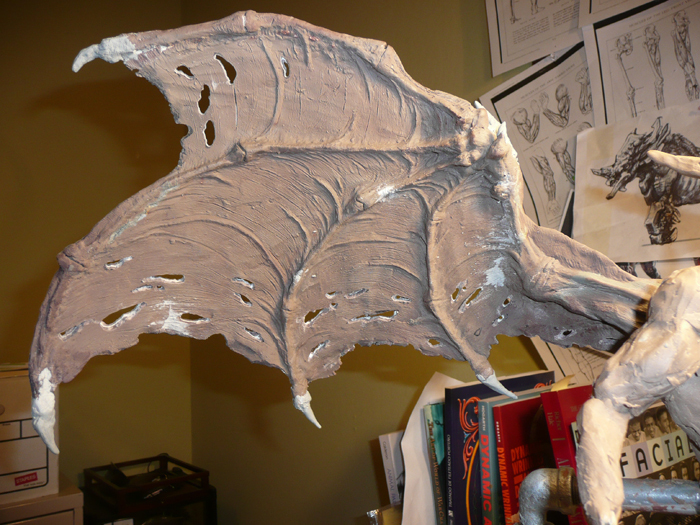 I use apoxie sculpt to make the “arms” of the wings. 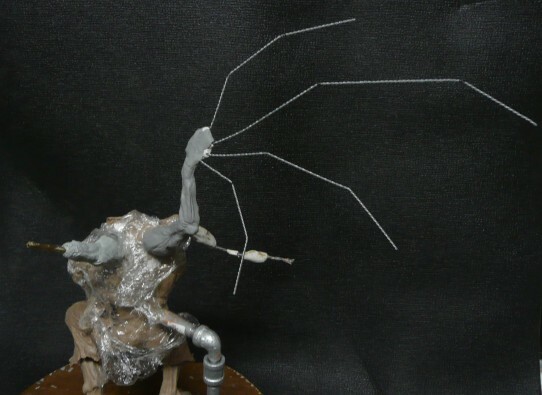 I used wire to make the “fingers” of the wings and put them in the apoxie before it hardened. I then took thin wire mesh and threaded the mesh through the wire fingers, and cut it to shape the membrane. (I don’t have a pic of this process, so I will take a pic when I do the other one.) I cut the mesh to fit, and then pushed a thin layer of apoxie sculpt into the mesh to form the membrane. After that hardened, I put a layer of Firm Super Sculpey over that so that I could add detail. I know of some sculptors that actually do the detail in the apoxie as it hardens, but my skills aren’t up to that level yet. After I had most of the details done, I baked the wing, and then took a dremel tool with a cutting bit and drilled into the wing to form ragged holes. 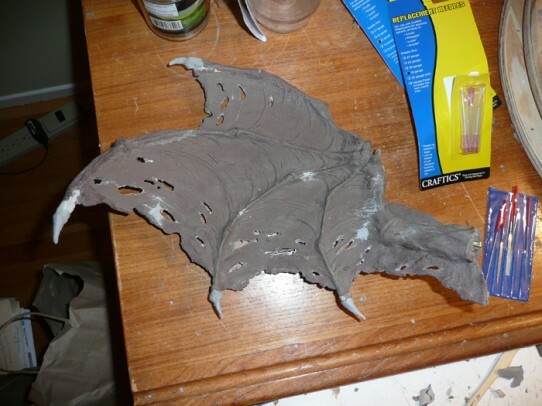 I also used the dremel tool to make the edges of the wings look more tattered as well. Now that it is baked, I’m going back with mores sculpey to add spikes, fix some cracks and add more detail. I use a heatgun to bake the new sculpey. Now I have another issue. 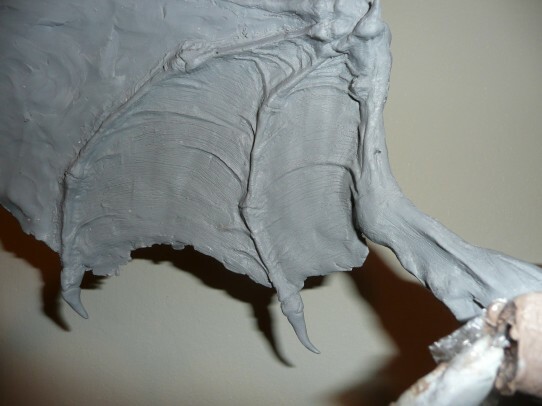 Do I go through the hassle (and money) of making a mold of the wing, pouring in wax, let it harden, and then warm the wax under hot water and try to reshape the wing to bend the other way? Or make the right wing from scratch, as I did the first.